Andy and Brian Kamenetzky talk Lakers, NBA, movies, TV, and anything else that comes to mind. Andy and Brian react to Magic Johnson sudden resignation and where the Lakers go from here. The Lakers are hanging by a thread. Can they turn it around in time? What went wrong, and what comes next? Plus, too much food! Anthony Davis is still a Pelican (for now). What's next? Are Magic and Pelinka ready for a critical summer? Andy and Brian talk with The Athletic's Pete Zayas about the Lakers' recent struggles and the development of Lonzo Ball and Brandon Ingram. Andy and Brian discuss the injuries to LeBron James and Rajon Rondo, how the kids need to step up, and Anthony Davis trade rumors. Andy and Brian discuss the Lakers' strong play, Kyle Kuzma's development, KCP-Ariza trade rumors and the Kevin Hart Oscars mess. Andy and Brian discuss the Lakers' strong homestand and Kevin Durant's thoughts on playing with LeBron. Plus, the annual Hallmark Christmas movie game! Andy & Brian discuss the state of the Lakers after nearly 20 games and how the kids are faring alongside LeBron. Andy and Brian make predictions on all things Lakers and the NBA! Andy and Brian talk about Lonzo Ball's return to action, the challenges for Luke Walton, and the Jimmy Butler drama. Andy and Brian discuss the Deng buyout, the Lakers' supporting cast, Andrew Bynum's comeback attempt and the death of Burt Reynolds. Andy and Brian discuss the Lakers' schedule, LeBron's minutes, Kawhi to the Clips and Aretha Franklin's death. Andy & Brian discuss the Kawhi Leonard trade with The Athletic's Eric Koreen, plus Josh Hart's emergence and 'The Dark Knight' turns 10. Andy and Brian discuss Julius Randle's departure, Rajon Rondo's arrival, the Melo question and what's still needed for the roster. Plus, an amazing BBB press release! Andy and Brian talk all things LeBron and the Lakers. Brian and Andy Kamenetzky are live from the UCLA Health Training Center as the Lakers wrap up the 2018 NBA Draft. They are joined by Lakers General Manager Rob Pelinka fresh off his press conference and head coach Luke Walton. Brian and Andy Kamenetzky are live from the UCLA Health Training Center as the NBA Draft rolls through. Lakers first round selection Moritz Wagner calls in to discuss his emotions in joining the Lakers. The guys are joined by ESPN Lakers reporter, Ohm Youngmisuk, and Lakers sideline reporter, Mike Trudell. Brian and Andy Kamenetzky are live from the UCLA Health Training Center as they prepare for the Lakers first round selection. The announcement of the newest Laker. Ramona Shelburne joins them to discuss the Lakers draft pick and the ongoing offseason rumors surrounding Kawhi Leonard, LeBron James, and Paul George. Andy and Brian talk with The Athleticâ€™s Bill Oram about the Kawhi Leonard trade rumors, and the importance of this summer for the Lakers. Andy and Brian talk about the Warriors' greatness, Durant's disillusionment, LeBron the (unloved?) Laker and the death of Anthony Bourdain. What happens to LBJ when the Finals are over? Plus, Colangelo's burners and LiAngelo's Draft workout. Andy & Brian discuss Julius Randle's future, who's most and least untouchable among the Laker kids, and the upcoming 'Solo' movie. Andy & Brian talk about the NBA playoffs and looming free agency questions. Andy and Brian talk with Jon Weisman about his new book "Brothers in Arms: Koufax, Kershaw and the Dodgers' Extraordinary Pitching Tradition." Andy and Brian discuss the Kawhi Khaos, whether the Lakers should still covet Paul George and LeBron's amazing playoff run. Andy & Brian recap the Lakers' season, relive two Kobe moments, and make playoff predictions. Andy Kamenetzky talks with writer Jonathan Abrams about his new book, "All The Pieces Matter: The Inside Story Of The Wire." Andy and Brian discuss the Lakers' young core, Kobe's complicated Oscar, and Kevin Love opening up about mental health. Plus, The Big Lebowski turns 20! Andy and Brian discuss the Laker core's potential, Lonzo's numbers and J.R. Smith throwing soup. Plus, Corey Brewer gets a statue! Andy and Brian preview the Oscars with special guest Steve Mason. Andy and Brian react to the Lakers trading Jordan Clarkson and Larry Nance Jr., plus the rest of the deadline action. Andy and Brian discuss Lonzo's health, whether the Lakers have a strong enough culture for LeBron, and the Blake Griffin trade. Andy and Brian discuss Luke Walton's performance, the state of the Cavs and Thunder, Kobe's Oscar nomination and the 'Three Billboards' backlash. Andy and Brian discuss the effect of Lonzo's absence, Kuzma's slump, a hypothetical Anthony Davis trade and Gary Payton's statue. Andy and Brian discuss Paul George, Lakers fans' confidence in Luke Walton and the front office, and a song welcoming the Ball brothers to Lithuania. Andy & Brian talk with ESPN writer Kevin Arnovitz about Lonzo Ball's potential and skillset, plus the 35th anniversary of the film 'Tootsie'. Andy and Brian break down the road trip, Lonzo's improvement, LBJ to LA, and dive deep into Star Wars. Andy and Brian discuss Lonzo's shot, the politics of playing time, and how the 2018 plan is looking. Andy and Brian discuss the Lakers' improved defense, frontcourt minutes, D'Angelo Russell's return and fantasy football selfishness. Andy and Brian discuss the Lakers' preseason, the Lonzo effect, Tom Petty and the Rock & Roll Hall of Fame. Andy & Brian discuss the Lakers defense, 6MOY Jordan Clarkson, Melo to OKC and athlete protests. Andy and Brian talk with Sports Illustrated's Lee Jenkins about Dwight Howard's fall, Lonzo's potential and superstars linked to the Lakers. Andy and Brian talk all things "Yacht Rock" with 'Beyond Yacht Rock' hosts JD Ryznar and Hunter Stair. Andy and Brian discuss Kobe's retired jerseys, #NBA Rank, Ball In The Family and great '80s movie/song combos. Brian talks to acclaimed director Michael Apted (Coal Miner's Daughter, "Up" documentary series) about filmmaking, the growth of great TV, and his new film "Unlocked," opening September 1st. Andy and Brian Kamenetzky talk tampering, the Kyrie-Isaiah trade and give Joe Smith a statue for his service with the Los Angeles Lakers. Andy and Brian Kamenetzky discuss expectations for Lonzo Ball, NBA players staying political, teen movies and Behind The Music. Andy and Brian discuss Lonzo Ball's potential, the new rest-centric schedule, an even tougher Western Conference and the definitive fruit rankings. Brian talks with actor Jason Mitchell (Straight Outta Compton) about acting, Eazy-E, and his role in "Detroit." What does Kyrie Irving's trade demand mean for LeBron-to-L.A.? Plus KCP, Derrick Rose, and OJ gets paroled. Andy and Brian react to Lonzo Ball's early NBA Summer League showing, the latest Paul George news and free agency. Andy and Brian discuss the Lakers' draft, Lonzo Ball, trade rumors and Rob Pelinka's plans. Plus, the Hallmark Christmas movies game! Andy and Brian Kamenetzky break down how the NBA Finals affect the Los Angeles Lakers, Lonzo Ball versus Josh Jackson, and Jerry West to the Los Angeles Clippers. Andy and Brian Kamenentzky welcome veteran actor Brian Cox (Braveheart, Bourne Identity) to talk about his career and new film, "Churchill," opening June 2nd. Andy and Brian Kamenetzky talk Lonzo Ball and the #2 pick, Magic's views on Brandon Ingram, Star Wars and TV comedy. 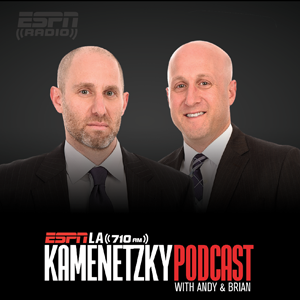 Andy and Brian Kamenetzky discuss the Los Angeles Lakers getting the #2 pick and whether they'll draft Lonzo/LaVar Ball. Andy and Brian talk NBA playoffs, D'Angelo Russell, Rob Pelinka, Jim Buss' statue and Prince. Andy and Brian talk with Tabitha Soren about photography, media, Tupac, and her new book, "Fantasy Life, Baseball and the American Dream." Andy and Brian Kamenetzky talk with comedian W. Kamau Bell about race, the Warriors, Denzel and his CNN show "United Shades of America." Andy and Brian Kamenetzky discuss the Los Angeles Lakers youth core, Kevin Durant's return, the Cavs' skid and Hallmark Christmas movies. Andy and Brian discuss the NBA "rest" dilemma, D'Angelo Russell's play and flat Earth truthers. Andy and Brian Kamenetzky discuss the Buss family's battle for ownership of the Los Angeles Lakers. Andy and Brian discuss fourth quarters without Lou Williams, D'Angelo Russell's leadership potential, Kevin Durant's injury, and Bill Paxton's career. Andy and Brian discuss Magic Johnson taking over the Lakers front office, the Lou Williams deal and DeMarcus to New Orleans. Andy and Brian discuss the Deng and Mozgov demotions, Magic rejoining the Lakers, Phil versus Melo and Oak versus Dolan. Andy and Brian Kamenetzky discuss the Lakers at the halfway point, the core kids' potential and the Kyle Korver trade. Brian & Andy continue discussing the split of Phil & Jeanie while also getting into Luke Walton taking the blame for the Lakers' loss to the Utah Jazz. The guys wonder just how much learning Luke still needs to do as a head coach. Also, when is it ok to give shotguns as a Christmas gift? Will Jim Buss be back after this season and could Jerry West re-enter the Lakers picture? Plus, Andy and Brian Kamenetzky explain how Phil and Jeanie's separation could affect the Lakers moving forward. With a quarter of the season gone, Andy and Brian Kamenetzky breakdown the Lakers fast start, Brandon Ingram's future and Luke Walton's impact. Andy talks with 'You're The Worst' star Desmin Borges about comedy, PTSD, Sunday Funday, Chicago sports and Purple Rain. Andy and Brian Kamenetzky welcome Director Ricki Stern whose documentary, "Marathon: The Patriots Day Bombing" premieres November 21st on HBO. Andy and Brian Kamenetzky break down a surprising early season start for the Los Angeles Lakers and dig into the new season of, "The Walking Dead." L.A.'s biggest camp surprise? Nick Young is still here, and playing well. Plus, how NBA scouts view Julius Randle, and R&R HOF nominations.